How to Shuffle Tarot Cards, Angel Cards or Oracle Cards Properly! The truth of the situation is that there's no right or wrong way to shuffle your cards. However, there is one important key that really makes the process work! 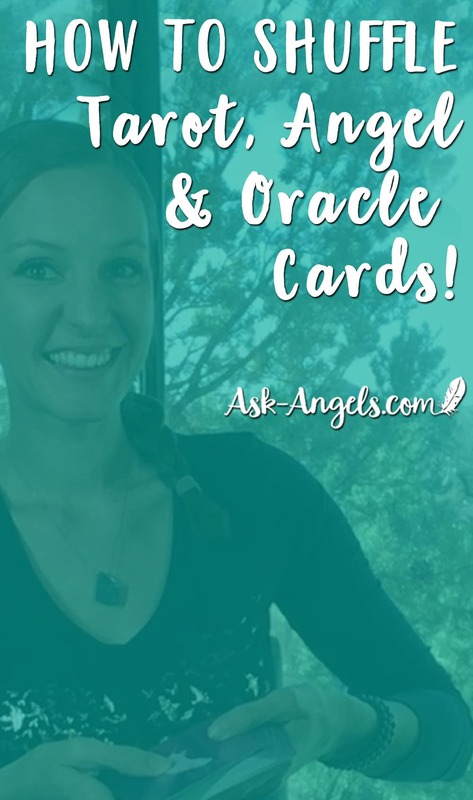 Click play below to watch how I shuffle Tarot or Angel cards… I’ll also share with you the important key that makes just about any method effective, and in addition, I’ll share the top five ways of shuffling, so you can try them out and find the way that works for you. If you’d prefer to read about these Tarot Card Shuffling Methods… Just keep scrolling down to read about them instead! Now, first and foremost, the most important thing to do before shuffling your Angel, Oracle or Tarot cards, is to center your energy. Call in the light to surround you, uplift your energy and raise your vibration. Next, focus your awareness on your heart center. Focus within and get yourself into a high vibrational state, because that is required for you to truly tune into direct guidance available while reading Tarot or Oracle Cards. To do this, I like to envision an orb of light around the entire deck of cards… Holding the intention that this light cleanses out any old energy and stored negativity while ushering in the incredible Angelic energy of light and love. Once you do this, start to shuffle your cards. 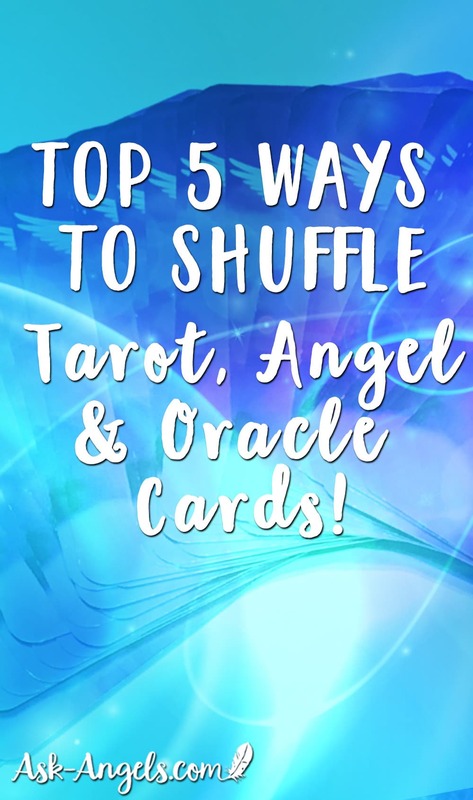 5 Ways to Shuffle Tarot Cards, Oracle Cards, and Angel Cards! The first way you can shuffle is what could be called a top-down method. You would hold the deck vertically in your left hand, and then take about half of the cards into your right to then drop the cards down among the cards still held in your left hand. With this method, be careful to not damaging the edges of your cards as you continue to drop more cards down into the deck to shuffle. For the next method of shuffling, you essentially shuffle your cards as you would with playing cards. While envisioning light around your cards, split the deck into two pieces and gently shuffle them together as if you were shuffling playing cards, just keeping in mind that you want to be a little more gentle with your Tarot or Oracle cards than you are with playing cards because they’re usually a bit more fragile and prone to becoming damaged when bent. Proceed with this process until your cards are nice and mixed up. The “cutting the deck” method works well, especially if you have a tabletop in front of you. And if that's the case, you can also use this next method or fanning the cards out as if in a rainbow, and then shuffle their order around a bit, and respread the cards out in a fan. One good thing about this method is that it displays your cards in front of you in a rainbow-like spread where you can then easily see a part of each card, and you can then use a pendulum, to select the cards for your reading… Or you can use your hand, scanning your hand over the cards until your hand feels a little bit of a tingle or a warmth or some other sort of indication causing a certain card to stand out from the rest. Finally, the fifth method, which is also how I shuffle Angel and Oracle and Tarot cards – The Push Method. To use this method of shuffling, you hold the deck in your left hand and then push about five to seven cards into your right hand using your thumb. Then push five to ten more cards on top of those, then five to ten on the bottom, then again push more cards to the top, and the bottom and then when you’ve moved the entire deck over to your right hand in this way, start to push the cards back to the left hand, push top, bottom, top, bottom. The thing that I like about this method is it has a way of showing you the right cards… They have a way of sticking out of the deck just a little bit calling your attention to which cards to choose. I intuitively started using this method, but with a bit of research, it seems to be called the cowie push/put method. I don't personally place much emphasis on reverse cards when reading Tarot or Angel Cards… Seeing them only as a bit of extra emphasis or perhaps a challenge. That being said, with Tarot especially, many people do read reversed cards as having a much different meaning. If you want to make sure you're giving reversed cards the full opportunity to show up in your readings, just flip about half of your cards 180 degrees about halfwayay through shuffling using any of the above methods. How Many Times to Shuffle Tarot Cards? Whatever method you like best to shuffle your cards, just be sure you shuffle them thoroughly and completely. Once you feel your cards are sufficiently shuffled, you can then pick the tarot cards for your reading. If you do have cards jump out of the deck while you're shuffling, its up to you as to whether you want to use these as the main cards for your reading… Or as extras. I personally, use the cards that jump out as the main cards… Noting they have an extra emphasis. Once you draw the card or cards for your reading… Turn them over and gaze into them. This can then trigger your receiving direct Angel messages and give you the opportunity to download the expanded meaning and guidance using your intuition. to download divine love. As you draw a card, open your psychic senses and allow yourself to first pay attention to the image you see on the card. What is the first thing that your awareness is drawn to? Focus on this aspect of the card image, and on what it says to you. This can begin the flow of guidance. Trust the guidance you receive and know that yes, Angel cards are an incredibly powerful way to get that direct link with the Angels and their guidance and messages and love flowing. If you would like more help with this process, be sure to check out my Angel Intuition course. Most importantly, keep your heart open, keep yourself, your cards surrounded by love and light and trust that the cards you draw are exactly the right messages meant to appear. Keep reaching up towards the higher levels of love, towards the higher realms and with this as your core intention of truly connecting with divine guidance and wisdom for healing, for inspiration, for knowledge and truth, how you shuffle really doesn't matter. It is about finding what works for you and then trusting that the right cards will appear and then download divine love and allow the Angel’s messages, love, guidance, healing, insight and wisdom to flow through. I recommend that the guide or person conducting the reading shuffles. Sometimes people like to let the client choose the cards… But in most cases I prefer to choose the cards too — But really its up to you and there are no set rules here.